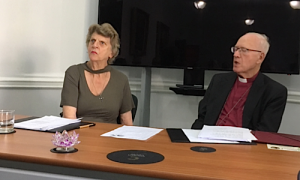 Sandra Saer, who chaired the Keep Rebuilding Bridges Conference, at Church House, Westminster, on 5 October 2018, waiting with Lord George Carey, former Archbishop of Canterbury, a key Speaker at the Conference, to hear a question from the floor. The second Rebuilding Bridges conference on October 5 marked the 60th anniversary of George Bell’s death and continues the process of restoring his place in history. An Opening Prayer was said by the Rev’d Ivor Cameron-Smith, who was made Deacon, and later ordained, by Bishop Bell, (and whom, as he said later, he had always revered). This was agreed with, and expounded upon, by former Archbishop of Canterbury, Lord George Carey of Clifton, and supported by the Rev’d Canon David Jasper, Professor of Literature and Theology, and Head of the Department of Theology and Religious Studies at Glasgow University. Indeed, Lord Carey noted, after the three had spoken, that the Conference had become more of a Seminar, with the interaction of comments. That magical interaction of all the Speakers continued, with Questions and Answers throughout the proceedings, and with the contributions of Vasantha Gnanadoss, a former member of the General Synod, and the Rev’d Patsy Kettle, a former Minister in the Diocese of Guildford. Rev’d Kettle made special mention of Richard Symonds who, from the time he organised, on 2 December 2017, a Bell Petition, supported not by hundreds, as he expected, but by thousands (see details on The Bell Society website), had worked tirelessly in the cause to remove the ‘significant cloud’ placed over Bishop Bell by the present Archbishop of Canterbury, Justin Welby, which he has never retracted. The last speaker was Ruth Hildebrandt Grayson, whose father knew George Bell and Dietrich Bonhoeffer, and she spoke of their friendship and work together. 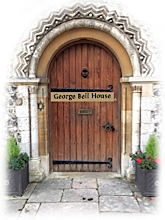 Mrs Grayson also spoke about ‘Sanctuary in Chichester’, the project to acquire a place in Chichester to act as a Centre for work with refugees and asylum seekers, and to commemorate Bishop Bell’s precedent of similar work in the years around WW2. Email for information. Lord Carey closed the gathering with a heartfelt Prayer. The following transcript has been edited to respect the Chatham House rule and contains links to attributable contributions made from the platform, framed within the words addressed to the meeting by the Chair. Sandra Saer (Chair): Not everybody is here, but I think we should start proceedings, because we have an agenda, which we don’t have to keep strictly to, but we want to try and keep to it as much as possible. Before the apologies for absence, I want to say a few words. My eldest son has told me that I mustn’t say too much! So, I must do as I am told! As I was preparing to speak to you as your chair today, something came into my mind which I think resonates: ‘Let’s turn ‘For whom the Bell tolls’ into ‘For whom the Bell chimes’. 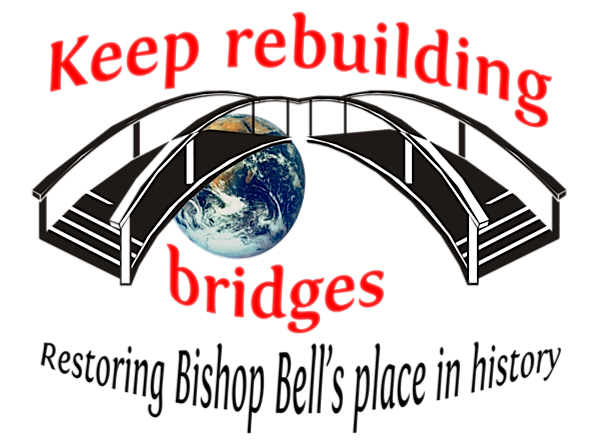 That is surely why we are here at this second Rebuilding Bridges Conference, to work towards the day, and I believe it will come, when George Bell, a great Bishop and an outstanding humanitarian, will get back his place in history, to be remembered and revered. Before I introduce the first Speaker – I don’t think he needs much introduction, actually! – I would like to say a few thank-you’s, in case people need to leave, before the end. My thanks to the stenographers during the day, for their amazing work (in fact, only one stenographer was present). Thanks to Richard Symonds for organising this, and to the person who contributed so generously to their cost. Thanks to the staff of Church House. I know we paid to be here, but you don’t pay for the sort of kindness and helpfulness we have received – they have been quite wonderful, especially Katie, who looked after the catering arrangements. Coffee has been laid on, and you will be provided with a good, what Katie called ‘afternoon tea’, that is a light lunch, at one o’clock. Most of all, I must thank Richard Symonds. He has worked long and tirelessly on this second Rebuilding Bridges Conference. If he had not organised the first, in February, we would not be here today. He and I have paid for your refreshments, so if anyone would like to make a contribution to the costs, we would be very grateful. Now, without further ado (my son would be pleased I am stopping), I would like to ask our first Speaker, Bishop Dr Gavin Ashenden, to come and address us. Sandra Saer (chair): Thank you very much indeed. Sandra Saer: The error of my ways has been pointed-out to me – I haven’t given the Apologies. We have had apologies from Margery Roberts, Barry Sheerman, MP Sister Frances Dominica, the Bishop of Chester, who has been very supportive, Lord Carlile, Baron Rowan Williams, the Duke of Richmond, Christopher Hill, and Ian Hislop. Ronald Crane and Jackie Ottoway, of Portal, have also sent their apologies. The other thing, again, error of my ways, is that I have not spoken of the Resolutions, and what we are going to do about them. I will do that now. You will see that Richard has very thoughtfully put the Resolutions on the back of your Agenda, and it gives you a chance to look at them. It has been decided that, in view of the Bell 2 Report being organised at present, it would not be politic to vote on these Resolutions today. I hope that is in order with all of you? I think it would be wrong in a way; it would be ‘jumping the gun’, which is something we certainly don’t want to do. Sandra Saer: I have two Speakers here for 3.15 but we are nowhere near that time, and it looks as though we might finish rather earlier than expected to. We have the Rev’d Patsy Kettle and Canon Professor David Jasper. Which of you would like to speak first? Sandra Saer: Thank you very much. (applause). Now may I call on Ruth? Sandra Saer: I wonder if you would allow me to say a few words, before we finish what has become a seminar, as Lord Carey has called it. Some time ago, when Pope Francis visited Ireland, I thought I would get The Independent i, a well-written and well-edited newspaper, to see what they wrote about the visit. But even The Independent i, as well as other newspapers, really went to town on the Pope, as being someone who hasn’t done anything – and what was he doing in Ireland? – and he has got to forgive, and so on… Well, that of course is exactly why he went: to ask forgiveness on behalf of his Church. I got so hot under the collar that I wrote a letter, and sent it to The Tablet, The Church Times, The Independent i, and to The Spectator (one of whose writers had brought up the Pope and forgiveness subject in The i’s Matrix feature. At the end of my letter, I put that, if somebody, like the Pope, or some organisation, sincerely asked for forgiveness, we have to forgive. By doing so, we are halfway to forgetting. And I really do hope that, in the context we have heard and enjoyed (if that is the word) today, those words will stay with you. Sandra Saer (Chair): Well now I have got the job of summing up. That’s what it says here: Summing up – Sandra Saer. Just a few words, before I ask Lord Carey if he will say the Closing Prayer. Various people here, including two of our Speakers, have talked about the literature of the Bible, and literature in general. Words came into my mind. ‘A hard coming we had of it’, and that is to paraphrase T S Eliot’s words in ‘The Journey of the Magi’, one of the finest poems ever written. We have come a long way – and many of you have travelled a long way to be here – towards achieving our common goal today: To restore Bishop Bell to his rightful place in history, and in living history. With that, I declare this meeting closed, and would ask Lord Carey to give the Final Prayer.